As you are probably all aware already, the fewer engines you have, the better your fuel efficiency; that’s why the airlines are selling off their (quadjet) 747s and buying (twinjet) 777s, why they’ve already sold off their (trijet) DC-10s, (trijet) L-1011s, and (trijet) MD-11s and replaced them with (twinjet) 767s, (twinjet) 777s, and (twinjet) 787s, why the (quadjet) A340 lost out to the (twinjet) A330, why the (quadjet) 747-8 and (quadjet) A380 are struggling to sell while the (twinjet) 777 and (twinjet) A350 are selling like 737s, and why the (trijet) MD-11 went over like a lead balloon compared to the (twinjet) 767, (twinjet) 777, and (twinjet) A330. One obvious solution to the kerosene-guzzling-quadjet problem would be consolidation: replacing the two engines on each wing1 with a single, bigger engine (for instance, replacing a 747’s four JT9Ds, CF6s, RB211s, or GEnxs with a pair of GE90s, or an A340’s four CFM56s or Trent 500s with a pair of Trent 700s or GE90s).2 However, this generates the obvious problem that the wing might need to be redesigned for the different stress distribution of a twinjet, as opposed to a quadjet, design. Still, the change doesn’t have to be large. For instance, the A340’s wing is already almost identical to the A330’s; just deactivate the extra fuel tanks, chop off the bulge under the wing that was introduced to keep the airflow around the outboard engine from breaking the wing off, take away the outboard pylons, swap out the inboards for a pair of A330 engines, and you’re in business. Yet, despite the massive efficiency advantage to be gained, there’ve been hardly any serious proposals to reengine quadjets into twinjets in this sort of way, indicating that there’re other issues that’re showstoppers for twinjetting a quadjet; what are they? 1: I’m leaving trijets (DC-10, L-1011, MD-11, etc.) out of this discussion, as converting one of those to a twin doesn’t involve any change in the number of lateral engines - just taking out the center tail engine and making the laterals somewhat bigger. 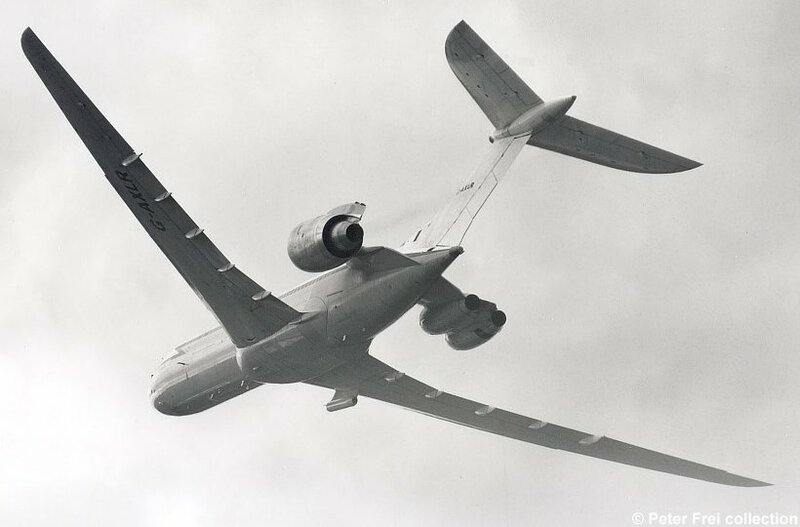 Also excluded are tail-mounted quadjets (VC10, Il-62), as these use conjoined engine pods (two engines per pylon), meaning that the two engines on each side could be swapped out for one bigger engine with little or no change in the stresses on the pylon and rear fuselage. 2: This doesn’t work for the A380, since not even the GE90 is powerful enough. Sorry, A380! Yes, you'll get a wing redesign to allow for the higher weight and thrust of the engines: the inboard engine mounts now need to be twice as strong. You can also run into ground clearance issues. An engine twice as powerful is often also larger. Here's a GE 9X engine being tested on a Boeing 747. You can see it's pretty close to the ground, and needs a really short pylon. Going from 4 to 2 engines also means replacing half the instruments in the cockpit. You could save a lot of weight by removing the wiring for the outer engines, but that'd be a major operation. Historically, the advent of high-bypass engines coincided with the introduction of widebody aircraft for a huge increase in passenger capacity and efficiency. So e.g. Boeing could make more money by offering a new design instead of selling 2-engined 707s. For the remaining 4-engined airliners (B747 and A380) no engine is powerful enough to allow a 2-engine conversion. 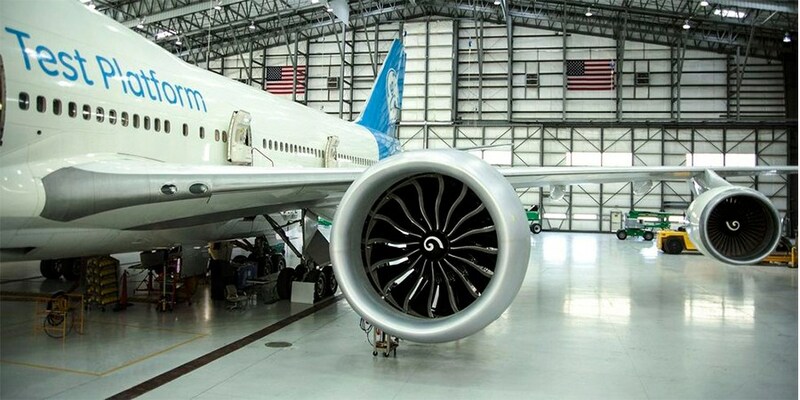 An engine powerful enough would be even bigger than the GE 9x shown above, and would scrape the ground when installed on a 747. The thing you are proposing might be marginally feasible in podded-engines-on-the-tail, or perhaps the Comet, but there is absolutely no sense in converting a jet like the original 747 into a mega-777. OK, so you've got 2 powerful engine instead of 4 weaker ones. So now the thrust is concentrated on 2 pylons instead of 4. This means completely redesigning the wing. Having 2 huge engines will also reduce wing bending relief. That probably means the flaps need to be redesigned too. Moving the masses of the outboard engine into the inboard engine positions changes the CoG of the aircraft. So now the elevators need redesigning too. In a single engine out situation, the sole remaining engine will provide almost the same amount of the original thrust on one side of the aircraft. And the aircraft must be able to either fly straight as if nothing happened or be in a long controlled descent. This means the to correct this yawing movement rudder needs redesigning too. As you can see, this is in effect a brand new design. So why not start a new design and let it be a twinjet right from the start? P.S. : This is why B-52 will never be a quadjet. Ever. Its rudder is just too small. Not the answer you're looking for? Browse other questions tagged aircraft-design jet-engine airliner or ask your own question. Can the 747 be re-engined as a twin? Is there a real risk of ingesting FOD into jet engines when using thrust reversers? Have we seen the last significant experiments in the configuration of jet airliners? Why does the B-52 have such a tiny rudder?